The International Harvester Co. is well-known for its farm machinery. Nearly every farm during a large part of the 20th century had at least one McCormick-Deering implement and many had a Farmall tractor as well. However, International trucks carrying the famed “Triple Diamond” emblem were almost as common. 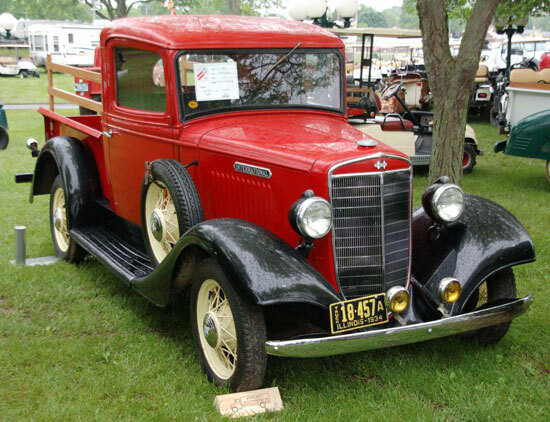 The good-looking International C-1 pickup replaced the D-1 in mid-1934. This well-restored example was displayed at the 2011 Antique Truck Historical Show in South Bend, Ind. When I drove an International KB-7 dump truck back in the early 1950s, we called all International trucks “binders” or “corn binders,” a nickname that reflected the company’s agricultural connection. Many people have heard of the Willys Co. as well, but not many know much about it, other than the fact that it made the famous Willys Jeep of World War II. At one time in their histories, the paths of the two firms, Willys and International Harvester, crossed, with major benefits for them both. It’s a little-known story except among International truck aficionados. IH made no light pickup trucks during the 1920s. Its smallest, the famous 6-speed special, was a 1-ton truck and other models were heavier still. When the all-new A series was introduced in 1930, it included the 3/4-ton AW-1, which sold for $650 in 1931 ($9,940 today), but nothing smaller. 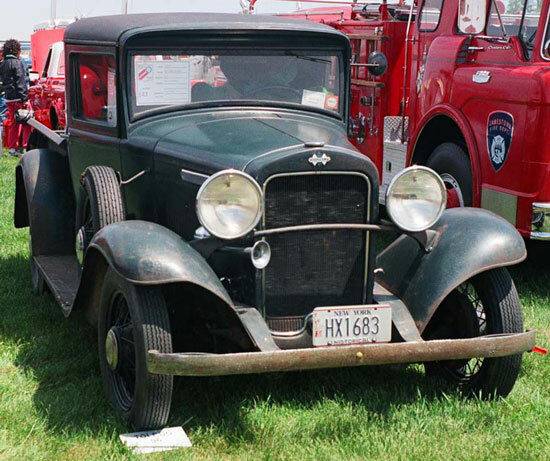 A 1933 International Model D-1 pickup truck at the 1996 Antique Truck Historical Show that appears to be mostly original. During the early 1930s and the dark days of the Great Depression, automobile manufacturers, hoping to attract customers, began to worry more about styling, with sweeping, sculptured body lines, lower, more streamlined profiles and colorful, two-tone paint schemes. Truck builders, including International, followed suit. 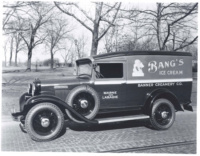 Trucks began to have more rounded corners, chrome radiator shells and colorful paint jobs. On IH trucks, that meant red frames and wheels, black fenders and green, red or black cabs. Hoping that a light pickup truck would appeal to the farmers who were buying their farm machinery, and desperate for a new product to help boost sagging sales, IH decided to offer a half-ton pickup. The big problem was that there was no money for developing such a vehicle – and they needed one fast. 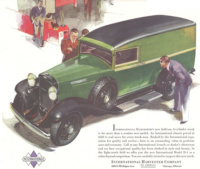 Overland Auto Co. was launched in Terre Haute, Indiana, in 1903 to build cars. The owners were wiped out in the 1907 Panic and production ceased. John North Willys, an automobile dealer in Elmira, New York, who apparently could really sell cars and had just ordered 500 Overlands from the factory, took over. He brought the firm back to prosperity and, in 1909, moved it to the old Pope-Toledo plant in Toledo, Ohio, where it became Willys-Overland Co. Although successful for many years, like most auto companies in the Great Depression, Willys-Overland was hurting badly. 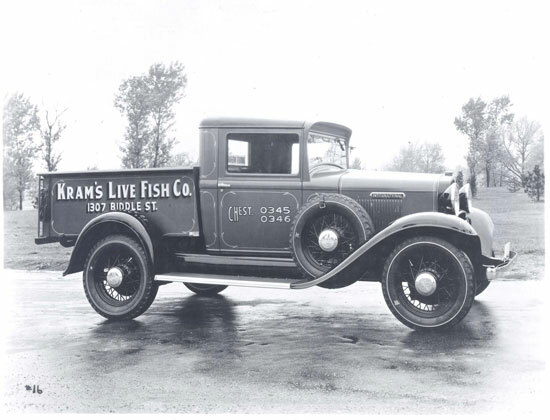 The firm unveiled the Willys Model C-113 half-ton pickup in 1931. It had a modern, flathead 6-cylinder engine with full pressure lubrication and insert bearings, but sales were disappointing. An International D-1 panel van being used as a dairy delivery truck. Then along came International Harvester looking for just such a truck. A deal was soon struck and Willys-Overland began building trucks for IH. The radiator shell on the new IH half-ton, designated Model D-1, was modified slightly to resemble the larger IH truck models, and the dash, badges and trim were different, but there was no mistaking the Willys heritage. IH had specified a larger engine for the D-1 as well. Instead of the 193-cubic inch engine that was in the Willys, the D-1’s 213-cubic inch engine put out an advertised 70 hp. Priced at $360 (a comparable Chevy half-ton sold for $330 and a Ford was $320 for the chassis and cowl unit), the D-1 was also available as a pickup and a panel van. Even though Willys had been able to sell very few of its C-113 pickups, the almost identical International D-1 truck sold like hotcakes, with 12,200 built at the Toledo plant during 1933. International sold a total of 30,164 trucks that year, meaning the little D-1 pickups and panel vans accounted for nearly one half of all IH truck sales. A factory photo of an International D-1 pickup truck with a special larger bed for hauling fish. 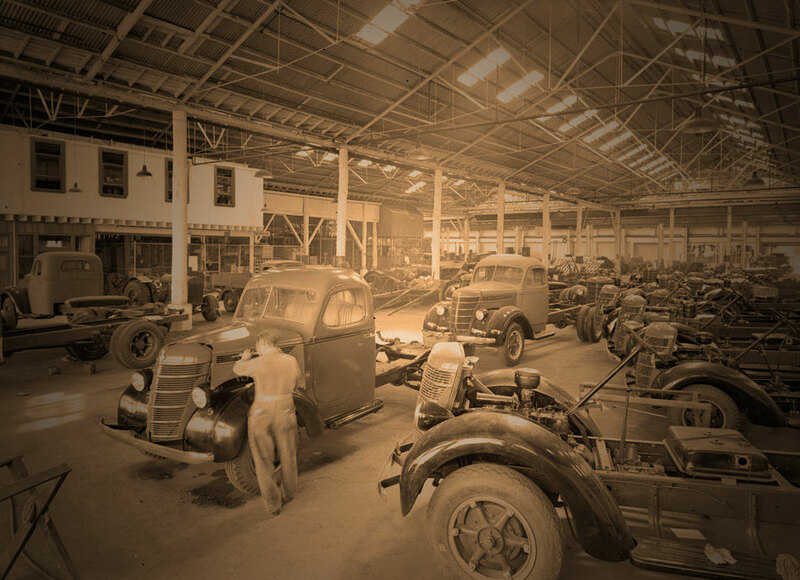 The relationship with International kept Willys-Overland afloat for a while, but the firm was too far gone to save and was forced into receivership in 1933. At the end, International Harvester had to have a man stationed at the Willys plant to immediately pay for the trucks before they would be released. Willys-Overland then reorganized and stumbled along until World War II, when the company did well building jeeps for the U.S. military. The company, now owned by Chrysler Group LLC, a wholly owned subsidiary of Italian multinational automaker Fiat S.p.A., is still building Jeep products in Toledo. Because of the D-1, IH was well-established in the light truck field, but in order to assure the supply of these vehicles, Harvester badly needed to develop its own half-ton and build it in its own factories. IH bought the rights and tooling to the 213-cubic inch engine from Willys at that time and used it all through the 1930s to power the company’s light duty trucks. A slightly improved version of this engine, the Green Diamond, was used in the International K-1 through K-5 trucks made from 1940 through 1949. 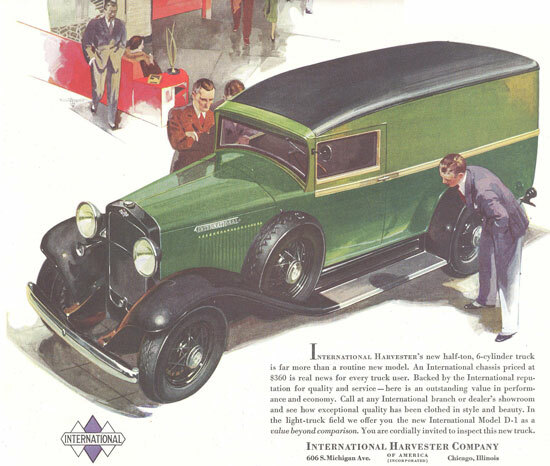 A 1933 magazine ad for the stylish IH D-1 panel van. IH managed to get some 2,500 D-1 trucks from the Toledo plant during early 1934, but the new IH C series trucks were due to come out that year and a replacement for the D-1 was the first of the new models, appearing about May. 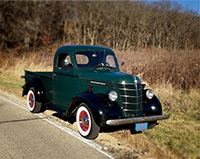 The new C-1 was a handsome truck, as pretty as many of the contemporary passenger cars, with a sweeping, skirted fender line, a V-shaped grill covering the radiator, and a fender-mounted spare tire on the right side. The engine, transmission and rear axle, along with some other components, were the same as the Willys-made version, while other parts were strengthened and improved. I’ve never seen a Willys C-113 pickup truck. Even though lots of the International D-1 trucks were built, very few have survived: I think I’ve seen two or three. Sam Moore grew up on a farm in western Pennsylvania. He now lives in Salem, Ohio, and collects antique tractors, implements and related items.